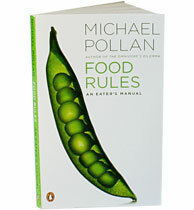 I’m currently flying through Michael Pollan‘s Food Rules, an Eater’s Manuel. The book is a how-to guide that reaches both those who are clueless and those who are tuned in. I would definitely recommend reading this book, and definitely recommend gifting it to someone you love. The book is based around Pollan’s simple rule: “Eat food, not too much, mostly plants.” It’s broken down into three sections (What Should I Eat? What kind of food should I eat? How should I eat? )in which Pollan provides simple sayings and rules of thumb that he has acquired throughout his travels. I wanted to share a rule or two (a moment of wisdom, if you will) from the first section of the book–to give you a taste and get you hooked.